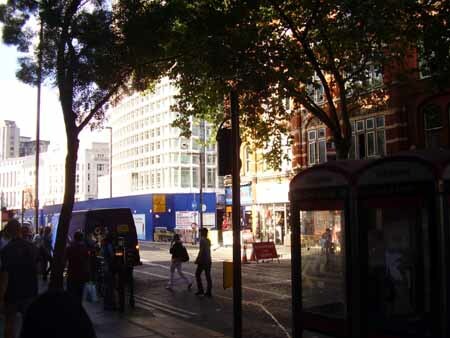 Update: 20th August 2009 - this whole block has now been demolished as part of the re-development of the Tottenham Court Road Tube Station. 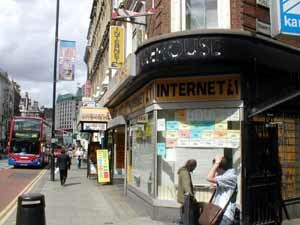 This offers cheap internet access, and mobile phone unlocking and accessories, and cheap long distance phone calls. Be very careful with your bags, mobile phones,purses, wallets etc, as these are a target for the local thieves. The internet PCs are also rife with various bits of spyware and password sniffers, so do not log into something sensitive or valuable, and virus check any removable media like flopy disks or USB memory sticks you connect to the PCs . The internet traffic also appears to be "known to the Police"
It is still worth a visit to observe internet low life and naive tourists in action. Note one of the local "stinkies" peering into the window.